This comparison is really hard because there are weekly updates for each browser. Let's try to make a little chart! 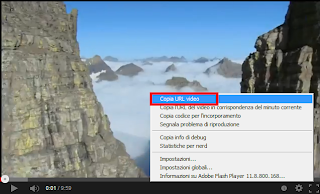 NOTE.Youtube stopped direct Adobe Flash support on Jan 2015 and the new format is HTML5. 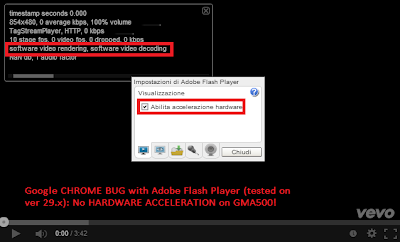 Check that your browser runs correctly Adobe Flash Player because GMA 500 doesn't support hardware rendering for support VP8/9 decoding. 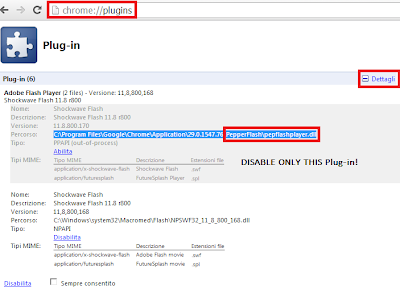 -Best browser for Adobe Flash Player Videos: Is possible to play FullHD Movies? Values are similar in every browser but IE10 use less CPU under "WIN7"
FullHD isn't reachable with Adobe Flash Player for Hardware Limit and Adobe's decoding process. HD fullscreen: (1366x768) brings GPU to the limit but some glitches compire: there is nothing that we can do (only wait for an optimized Adobe Flash Player). Conclusion:IE10-IE11 win in all my tests. Opera Next is a beta version of Opera and isn't optmized. Chrome has always the same problem with high ram usage. Conclusion: Incredible Internet Explorer CPU usage on youtube video (Avarange 30%)! N.B.Enable HW acceleration reduce CPU load but sometimes can't work properly reducing web surfing experience. Just test witch is the best compromise between CPU\GPU performances or leave default settings! Fare clic su Start , quindi scegliere Internet Explorer. Fare clic sull'icona Strumenti nell'angolo in alto a destra, quindi fare clic su Opzioni Internet. Fare clic sulla scheda Avanzate, quindi in Grafica accelerata, selezionare la casella di controllo Usa rendering software piuttosto che rendering GPU. 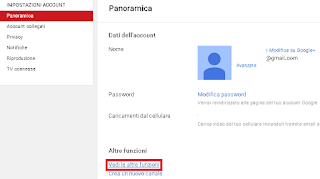 Chiudere Internet Explorer 9 e riavviarlo in modo che la modifica diventi effettiva. SVPtube (Smooth Video Project) is a free app to extract direct URLs to live streams from Youtube and send it to your preferred video player that can play this stram as a normal video. Run your web browser,go to youtube,select a video and right click on adobe flash player: "Copy Video Url", will autostart external video player. Note. This Tip doesn't work with all Videos! I don't want to talk about it deeply but I want only to suggest you: "Adblock Plus"
Freeware,can remove all ads (advances settings),remove standard ads\popup and youtube videos ads. Just add it to your browser: Internet Explorer,Chrome,Firefox,Opera Compatible! Firefox: Go to "About:Config" Section\ search for browser.cache\ set browser.cache.memory.enable = TRUE. Now we have to set how much ram we can give:create a new key with right click\New->Intero. In Parameter's name write browser.cache.memory.capacity and Set as Intero Value how many ram you want to give at the cache (1000 = 1MB). If you set value -1 the browser will set it automaticly. 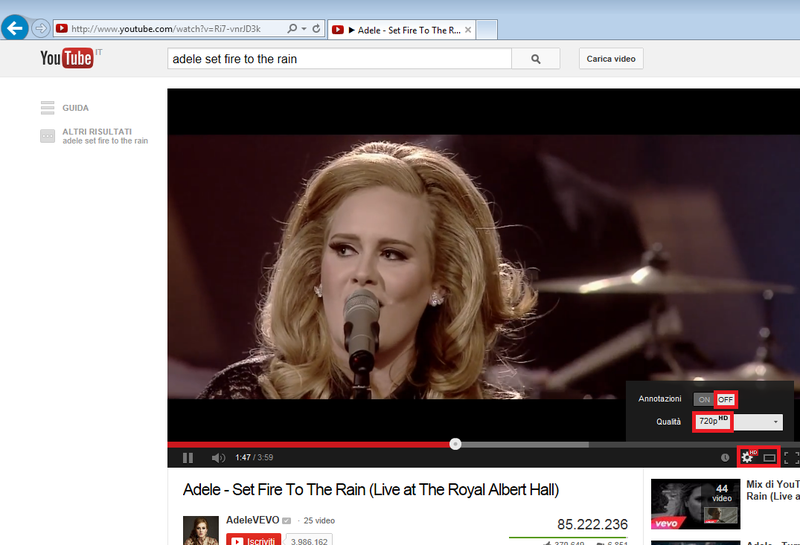 -Adobe Flash Player: windows and browsers are changing the way to support video streaming. 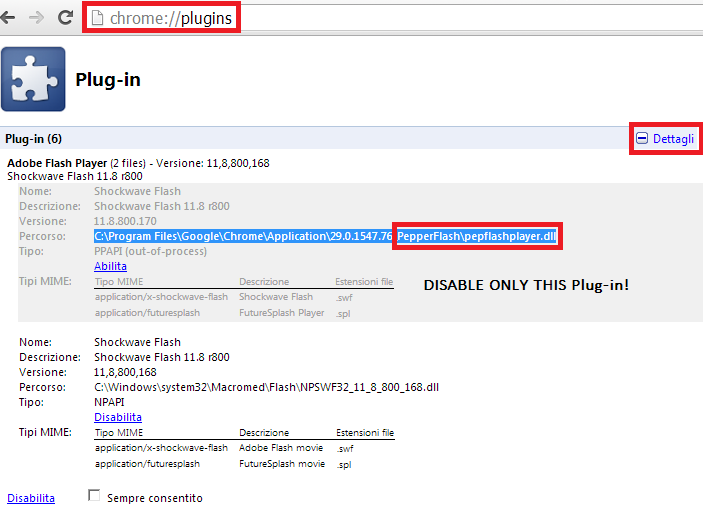 Now HTML5 is new standard and expecially internet explorer is removing hardware rendering on adobe flash files. Results change with different OS (win 8.x or xp); which kind of platform do you have? Have you tested Internet Explorer 11? Do you mean webpages rendering? Is possible to play FullHD Movies? Thank you for posting. I have tested WebM with CPU @ 1.33GHz and High Performance but i can't notice sufficient FPS. WebM (VP8) seems to reduce glitches but anyway audio is a little bit async.Maybe can be useful for HD fullscreen without OC. tested h264ify + about:config settings+ Atom Z520@1.33ghz with 2gb. 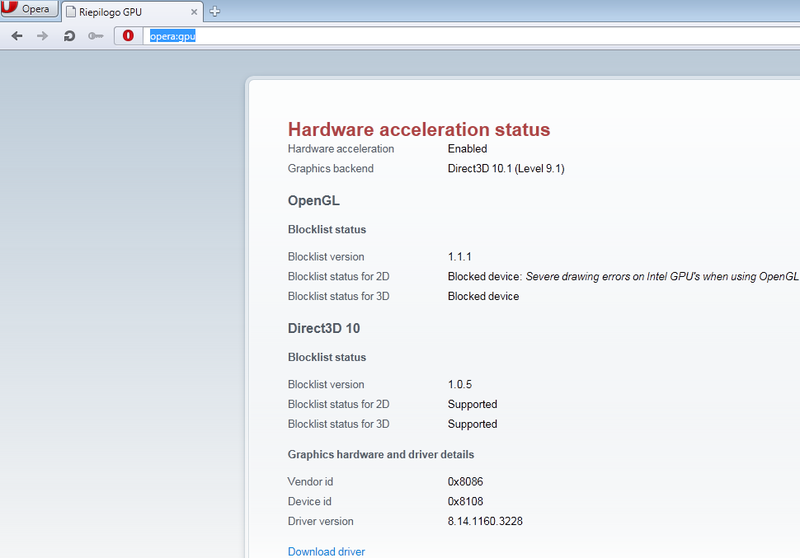 It's not necessary Adobe flash anyway my results are differnt and lower than yours. Hey, its possible to play twitch tv livesteams on medium-high quality? Hi, i'm looking for some solution. The main problem is that i have few time and i'm wasting it on xp driver and tray icon for iemgd xp (to close forever the support on xp). The unlucky thing about gma500 is that i didn't find nobody fixing problems on various OS. Actually win7 is still the best os for gma500 (i really need more time for win8/10 solutions because require more advanced knowledge about MSDN documents for ex how to reduce 2D hardware rendering usage). To play medium quality streaming you need a good old browser (not chrome) because newer releases are using much more hardware rendering for the Graphic user interface and so less power can be used for videos. Probably is also necessary an old version of adobe flash. 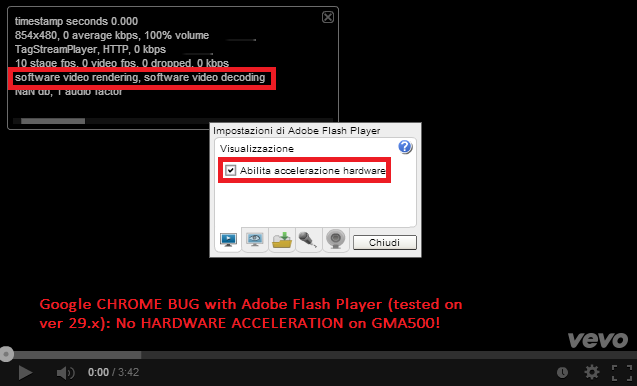 You can also use svptube or some addon/program to accelerate adobe flash video playback. These are basic tips but i will upgrade this post as soon as i can with new tweaks. Working Decode HTML5 HD (Youtube, netflix)?? of course. HOW-TO? PD: Theoretically, you could use filters and therefore directshow filter ciberlynk (which is the most efficient with this card), html5 video decoding, but not currently available have a laptop with intel gma 500. However, to do that, it would have to force Firefox to not use mediafoundation to decode video, and in turn, it would have to force who uses DirectShow, and by another application (Win7DSFilterTweaker), leave default filters ciberlink . Thank you for your tip. Really nice!. Anyway we will have problems when h265 will be the default standard because is not possible to accelerate it by vpu. I see unlikely to H265 format becomes standard in the short term, especially because many smartphone would be left out. On other tips, as I said, theoretically, changing the default filters that handles MFT (Media Foundation), through filters MFT Cyberlink, should significantly improve CPU utilization when decoding. I remember when I had my Asus Eee PC 1201 has the filter driving optimal windows was little, he could decode 1080p, but always used a 80 or 50% cpu. DirectShow filters and filters used Cyberlink MFT of about 30 or 20%. The Intel GMA 500 is a very capable gpu, gpu unfortunately is an architecture that requires to take full advantage of access to its low-level hardware directly, ie using an api that directly use that hardware. When used directx or open gl, becomes for its architecture a GPU very unstable (handles four shaders of various purpose, resulting often crashes when implementing directx or open gl), this would not be such a problem if there is a community of developers that endorse, but is not the case. Only now there is an initiative of Imagination-technologies to create some open source drivers for such gpu, at least in Linux, but still lacked long to see improvements. That is why also that directx and open gl walk so slow in this gpu, since the official drivers do not fully support such apis, and many of its functions are done by software (CPU), so Aero goes so slow, or Compiz in due case. I assume that the null support directx 10.1 was because of this, being that in theory should bear the gpu, probably the drivers was not stable when activated. The theme of HTML5 investigate him for quite some time, unfortunately this technology takes much advantage of DirectX 11, so necessarily will consume in this gpu more resources than flash, unless it fuerze the browser to use directx 9 forcing the dxva 2.0 browser to use, and MFT filters. However, in doing so many functions 2d acceleration is lost, in the case of intel gma 500 gives the same because not supported, but in other gpu is always better to run under DirectX 10 or DirectX 11.